The Display Gardens will be open until May 7th!!! 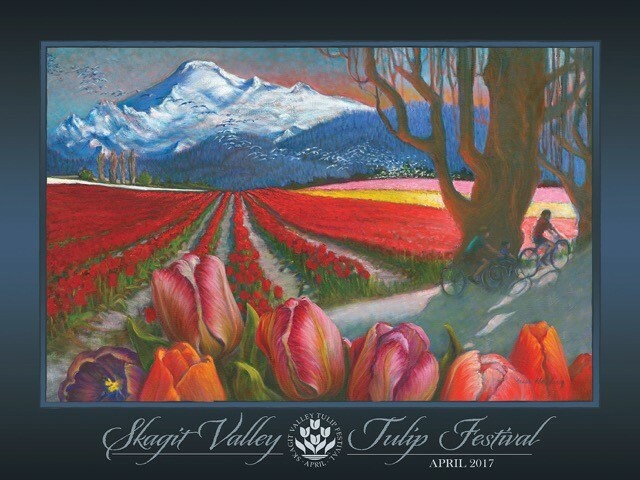 Welcome to the Skagit Valley Tulip Festival 2017! While last winter the tulips graced us early with their blooms, this colder winter means tulip blooms will be in peak bloom more toward the middle of April. The good news is the La Conner Daffodil Festival photo contest will be extended to April 14th and you may be viewing daffodil blooms instead of tulip blooms if you come early! Spring Getaway 2017 - Imagine Spring in La Conner! https://lovelaconner.com/wp-content/uploads/Spring-Getaway-2017-Imagine-La-Conner.jpg 901 1096 Love La Conner https://lovelaconner.com/wp-content/uploads/La-Conner-Washington-Logo-800x135.png Love La Conner2017-02-24 18:31:372017-05-30 11:12:43Spring Getaway 2017 - Imagine Spring in La Conner! UPDATE: PHOTO CONTEST EXTENDED TO APRIL 17th! You all have heard about the Skagit Valley Tulip Festival right? While the tulips are our most famous blooms, there’s nothing quite as wonderful as entire fields of bright, cheery daffodils against our Mt. Baker backdrop. It’s just so beautiful in March with the Daffodils blooming and there are so many fun events and exhibits in La Conner during March. If you can’t make it to Skagit Valley Tulip Festival in April, skip the crowds and join us in March this year for the La Conner Daffodil Festival 2017! La Conner is ready for your Skagit Valley Tulip Festival 2016 visit! Not only because all sorts of tulip festival events, art exhibits and happenings are going on, but also because in March we celebrate the La Conner Daffodil Festival. Because of our warmer than normal winter, the Daffodils started blooming early, and we are expecting the tulips to be at their peak during the Daffodil Festival and into the first two weeks of April! Plan Your Spring Getaway 2016 to La Conner! Are you planning a spring getaway and looking for things to do? The Skagit Valley has experienced a very mild winter and the daffodils are blooming! March and April are full of fun events and activities capped of with the La Conner Daffodil Festival and the Skagit Valley Tulip Festival. Imagine all the possibilities! https://lovelaconner.com/wp-content/uploads/spring_getaway_2016.jpg 892 1086 Love La Conner https://lovelaconner.com/wp-content/uploads/La-Conner-Washington-Logo-800x135.png Love La Conner2016-02-24 10:10:412016-03-08 10:56:36Plan Your Spring Getaway 2016 to La Conner! You all have heard about the Skagit Valley Tulip Festival right? While the tulips are our most famous blooms, there’s nothing quite as wonderful as entire fields of bright, cheery daffodils against our Mt. Baker backdrop. It’s just so beautiful in March with the Daffodils blooming and there are so many fun events and exhibits in La Conner during March. If you can’t make it to Skagit Valley Tulip Festival in April, skip the crowds and join us in March this year for the La Conner Daffodil Festival 2016! 2015 Best Tiny Town Washington State - La Conner! https://lovelaconner.com/wp-content/uploads/VotingPlatformLogo.png 140 240 Love La Conner https://lovelaconner.com/wp-content/uploads/La-Conner-Washington-Logo-800x135.png Love La Conner2015-05-27 16:56:492016-11-07 17:07:442015 Best Tiny Town Washington State - La Conner! Part of what draws visitors to our community during the spring and summer months is the beauty of the flowers that are grown locally. Last year we instituted a Sponsorship program and it was a huge success! Our goal is to fund 52 baskets plus the cost of daily watering. We are asking that businesses, residents and community supporters pitch in again this year and sponsor a basket. For only $75.00 you can help keep town looking beautiful throughout the season. https://lovelaconner.com/wp-content/uploads/P1010565.jpg 525 700 Love La Conner https://lovelaconner.com/wp-content/uploads/La-Conner-Washington-Logo-800x135.png Love La Conner2015-03-11 14:16:322015-03-31 18:35:52Keep La Conner Beautiful! 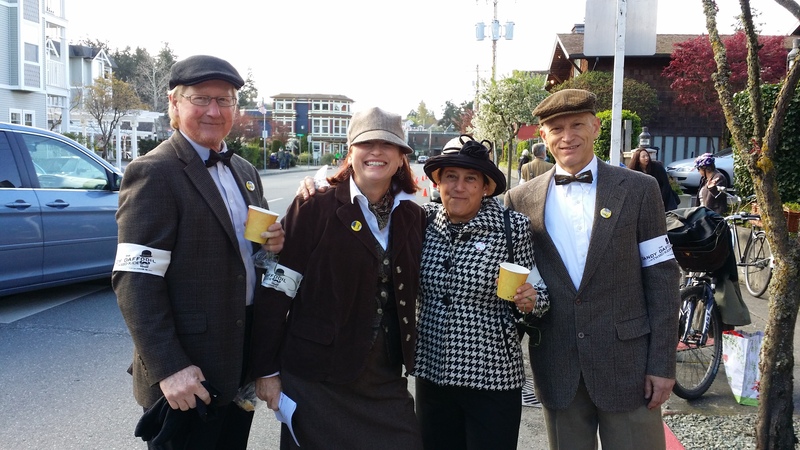 March 2015 Events - Happenings- La Conner Daffodil Festival! Are you planning a short getaway and looking for things to do? The valley has experienced a very mild winter and the daffodils are in full bloom! 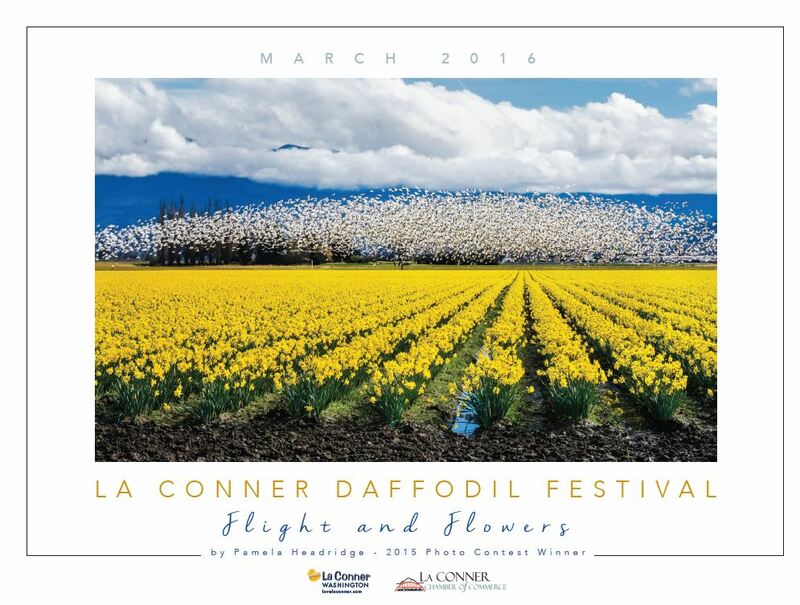 La Conner's inaugural Daffodil Festival is full of activities and a photography contest...When you visit La Conner in March, there are LOTS of things to do! 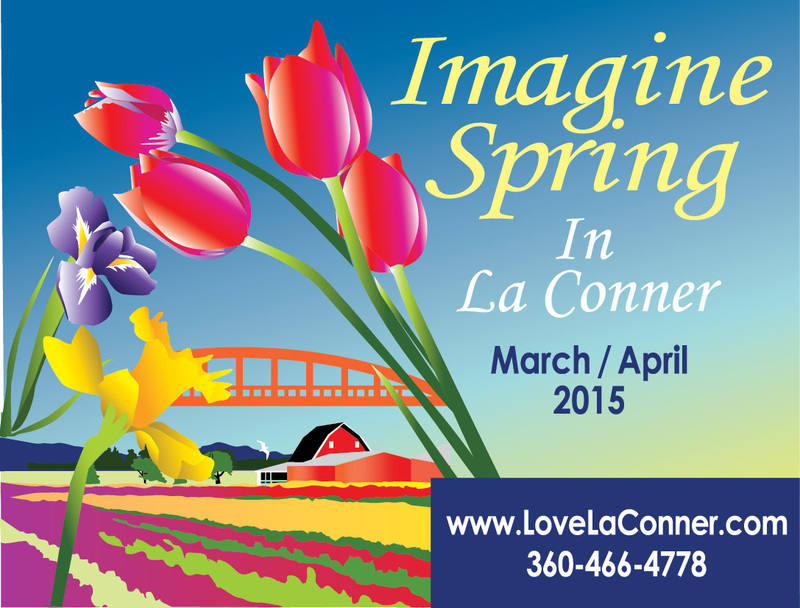 Imagine Spring in La Conner event cards are available at a variety of La Conner merchants as well as the Visitor Center - located at 511 Morris St.
https://lovelaconner.com/wp-content/uploads/2015MarAprilEvents-Web-Ap.jpg 826 1087 Love La Conner https://lovelaconner.com/wp-content/uploads/La-Conner-Washington-Logo-800x135.png Love La Conner2015-03-01 13:24:182015-03-11 14:08:01March 2015 Events - Happenings- La Conner Daffodil Festival! La Conner Daffodil Festival 2015 - Plan Your Trip! 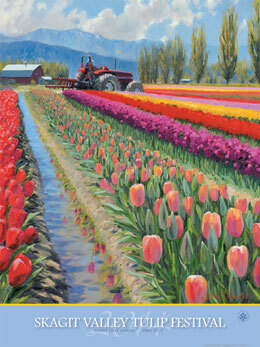 You all have heard about the Skagit Valley Tulip Festival right? While the tulips are our most famous blooms, there’s nothing quite as wonderful as entire fields of bright, cheery daffodils against our Mt. Baker backdrop. This year we are changing the March La Conner’s Unofficial Daffodil Festival … to the La Conner Daffodil Festival. Why not make it official? It’s just so beautiful in March with the Daffodils blooming and there are so many fun events and exhibits in La Conner during the month of March. Join us this year! https://lovelaconner.com/wp-content/uploads/la_conner_daffodil_festival_photo_winner_2014.jpg 3516 5314 Love La Conner https://lovelaconner.com/wp-content/uploads/La-Conner-Washington-Logo-800x135.png Love La Conner2015-01-26 11:32:542015-03-31 18:33:32La Conner Daffodil Festival 2015 - Plan Your Trip! May in La Conner is the perfect time for a spring getaway! The iris fields are blooming, boating is kicking-off, and it's a perfect time to stroll the La Conner boardwalk along the channel! Check out all of these great happening and events in La Conner for May. We are here to help you plan your May Getaway in La Conner! Should I bring my kids to the Tulip Festival? Would they be bored? What would I do with them? Those are great questions, and I think I can help! With a little planning, your stay will be enjoyable for all members of your family. 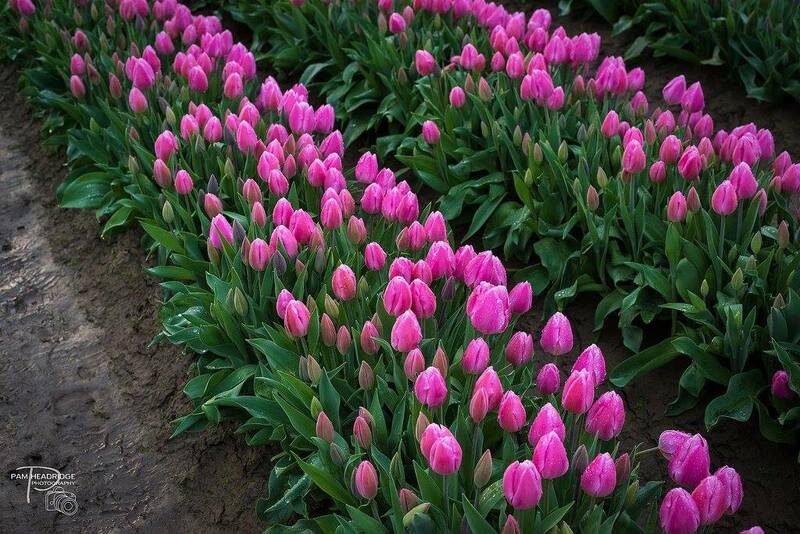 The tulip fields are an amazing place for kids to explore, and there are many Tulip Festival activities for kids! 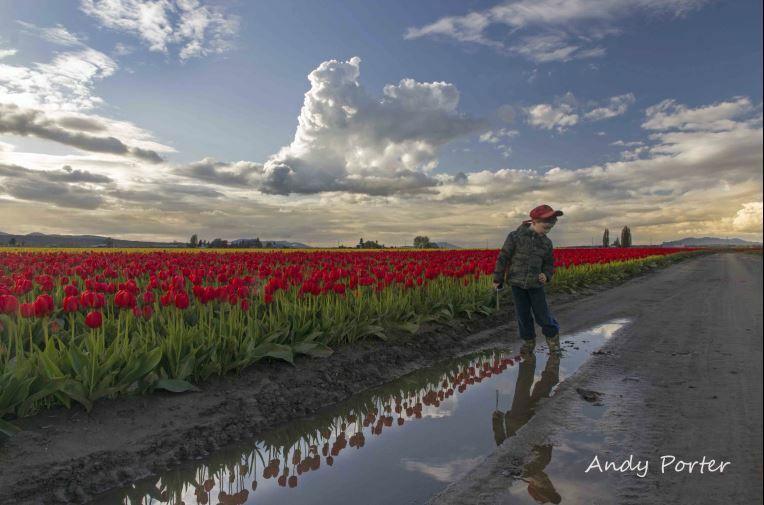 La Conner is ready for your Skagit Valley Tulip Festival 2014 visit. There are all sorts of tulip festival events, art exhibits and happenings while you’re here! La Conner Wine Walk May 2014 - Uncork With Us! If you’re a wine enthusiast, you likely already know that Washington State produces some of the finest wines in the world. And as luck would have it, not only can you taste many of them at our local wine shops, but you can take a walking tasting tour through La Conner during the La Conner Wine Walk. https://lovelaconner.com/wp-content/uploads/wine_walk-e1398972631294.jpg 658 750 Love La Conner https://lovelaconner.com/wp-content/uploads/La-Conner-Washington-Logo-800x135.png Love La Conner2014-02-01 11:46:512014-05-05 12:00:19La Conner Wine Walk May 2014 - Uncork With Us! Ahoy, Mates … It’s Boating Season in La Conner! https://lovelaconner.com/wp-content/uploads/La-Conner-Opening-Day-Boat-Parade.jpg 566 850 Love La Conner https://lovelaconner.com/wp-content/uploads/La-Conner-Washington-Logo-800x135.png Love La Conner2013-04-18 13:37:482014-03-16 10:20:05Ahoy, Mates … It’s Boating Season in La Conner! Celebrate Mother's Day in La Conner! https://lovelaconner.com/wp-content/uploads/La-Conner-Moms-Weekend-Getaway.jpg 560 857 Love La Conner https://lovelaconner.com/wp-content/uploads/La-Conner-Washington-Logo-800x135.png Love La Conner2013-04-15 14:07:532013-05-28 20:20:14Celebrate Mother's Day in La Conner! March 2013 Girls Getaway Washington State! https://lovelaconner.com/wp-content/uploads/Girls-Getaway.jpg 335 500 Love La Conner https://lovelaconner.com/wp-content/uploads/La-Conner-Washington-Logo-800x135.png Love La Conner2013-02-26 13:21:562013-04-01 12:19:34March 2013 Girls Getaway Washington State! Peak of Their Professions: The Murrow Brothers exhibit. This may be a once-in-a-lifetime opportunity to experience and learn more about the extraordinary lives of 3 of Skagit County's most famous and globally recognized residents - the Murrow Brothers. Opening Reception is Thursday May 10 at 5:30pm. Get your tickets now! Fields of daffodils, tulips and iris. Snow-capped mountains against bright blue sky. Lush green fields as they burst into life. There’s a reason why La Conner (and the Skagit Valley) is one of Washington State’s most-visited vacation destinations. It’s simply stunning here in spring!